On this week’s show, we discuss games, Games, news and play 8 brilliant pieces of music. Olympics – defining moments for us? 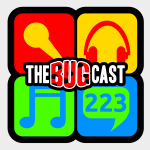 The next show will be episode 224 – broadcast live in the chatroom on Friday 17 August from 21:30 UK time. Another great show, you guys rock ! Good selection of music, and I particularly liked Aviator Shades. I think I won’t make it to the live chatroom next week – again ! – but I’ll do my best to be here the week after !